Study: Toff WD, Jones CI, Ford I, et. al. Effect of hypobaric hypoxia, simulating conditions during long-haul air travel, on coagulation, fibrinolysis, platelet function, and endothelial activation. JAMA. 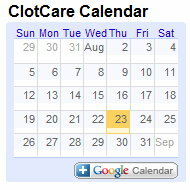 2006 May 17;295(19):2251-61.
clotcare/clotsairtravelfvlandcontraceptives.aspx) and published in the Lancet in March, 2006, found that the conditions of air travel increased indicators of clotting activation more than did simply sitting in a movie for 8 hours. The suggestion is that the low air pressure and/or low oxygen level in the airplane are responsible for the increased clotting activation seen with the 8 hour airplane flight compared to the 8 hour movie watching period. Younger individuals without risk factors who are allowed to get up and walk around every hour may not have an increase in clotting activity (based on the JAMA study). Patients who have risk factors for clotting (such as factor V Leiden and/or are taking oral contraceptives) and who are subjected to an 8 hour airplane flight tend to exhibit an increase in markers of clotting activity (based on the Lancet study). So, what is different about the two studies and how do the differences explain the apparently different findings? 1. The JAMA study utilized mainly younger individuals (61 of 73 patients were less than 50 years of age). It is well recognized that the risk of DVT starts to increase after the age of 50 and continues to increase rather dramatically in older patients. 2. The JAMA study did not include individuals with risk factors for clotting - the Lancet trial found that patients with the hypercoagulable condition factor V Leiden and those taking oral contraceptives were much more likely to demonstrate an increase in indicators of clotting activation. Those without risk factors usually did not show an increase in indicators of clotting (similar to what was seen in the JAMA study). 3. In the JAMA study, patients were allowed to get up and walk for 5 minutes every hour of the 8 hour simulation - a preventive measure that has been addressed on ClotCare (http://www.clotcare.com/clotcare/dvt.aspx). This degree of mobility may prevent activation of the clotting system by promoting circulation. Therefore, it would seem reasonable to conclude from both studies that younger individuals without risk factors for clotting are at low risk when flying on long trips if they get up and walk every hour. However, patients with risk factors for clotting tend to be more likely to develop indicators of clotting activation while sitting on an 8 hour airplane flight.